Located in a village which dates back to pre-historic and Roman times, Château de Sacy took on its present form during the Empire (beginning of the 19th century) when it was converted by its owners from a farm building, which it had been for two centuries, to a château. At the same time the owners, having made their fortune from the growing of sugar beet following an embargo on sugar importation, replaced the farm’s orchard with a fashionable “parc à l’anglaise”. The château’s present owner, who inherited the house in 1994, is a member of the same family that has lived in and seen the house through its transformation for over 200 years. 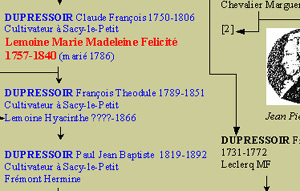 Click on the image for a genealogical tree of the owners of the Château de Sacy. The history of the Château de Sacy is closely intertwined with that of Sacy-le-Petit, a small village in the Département of Oise, Picardie. The estate of Sacy-le-Petit itself dates back to Roman times, its name probably derived from the old Gallo-Latin “Saciacum”, most likely referring to the estate of a man called Sacius or Satius. Sacy-le-Petit is a prehistoric site which was of great importance during the Roman occupation due to its proximity to the route later called “voie royale” (“royal way”) and also “le pavé” (“the cobbled road”), which passed through Estrées Saint-Denis. This route allowed the transportation of pewter taken from England all the way to Rome, where it had previously been unknown. The Romans set up a surveillance camp in the area in order to stop the pillage of convoys of these pewter-laden chariots by local inhabitants. The site of a Roman villa was also discovered during an aerial survey in 1975, at the locations known as the Champs de Francières, les Ravins et les Pintes. At the places known as la Motte-Riffard and Frotte-au-Cul (a name which indicates the growing of thistles), not far from the hillock mentioned above, a necropolis dating from the Middle ages was excavated from 1978-80, producing 50 graves from the 6th century. This necropolis would correspond to a neighbouring château-fort, of which there is no longer any trace apart from some old walls and raised ground in the Place de la Liberté. In 877 the Emperor Charles le Chauve gave the lands of Sacy to the abbey of Saint Corneille in Compiègne. The abbey of Chaalis also had equal possession of the lands, as mentioned in records of 1181, as did the abbey of Moncel. A chapel was constructed at the site where the church now stands. 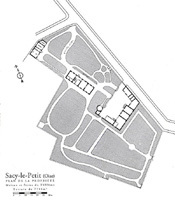 Click on the images for the 18th century plan of Maison Colin and Maison Doisy and the present day plan of the Château de Sacy. In 1624 Anne d’Autriche took the lands of Sacy away from the abbey of Saint Corneille and gave them to an order of nuns for whom she had constructed the abbey of Val de Grace in Paris, in order to give thanks to God for providing her with a son, the future Louis XIV. The Pottier family became, through the generations, managers of these lands and also of the Montagne mill which stood on top of the hill between Sacy and Grandfresnoy, the next village. At the same time as the lands passed into religious hands, there appeared the family of La Mothe-Houdancourt who owned a group of châteaux and also built one in Sacy, where a Philippe 1st de la Mothe, father of 19 children, died in 1651. In 1653 Louis XIV appointed a Field-Marshal Phillipe de la Mothe-Houdancourt, in return for his service in the war, and created the peerage Duchy of Fayel. Sacy-le-Petit became a châtellenie. Click on the image above for a plan of the farm owned by the Ladies of Val-de-Grâce, next to the church, purchased at the time of the French Revolution by Nicholas Pottier. In 1757 the Marquis de Gamaches, married to Jeanne-Gabrielle de la Mothe-Houdancourt, sold all his wife’s possessions in Sacy in order to clear gambling debts. Nicolas Pottier, manager for the Ladies of Val-de-Grâce, and his wife Marie-Françoise LeBrasseur, bought them. In 1758 the two of them acquired Maison Colin, a farm in ruins, and in 1779, another farm in ruins next to it, Maison Doisy. 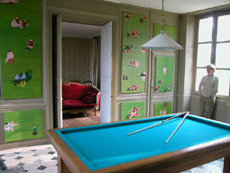 They knocked down the wall separating the two gardens and lived in the restored Maison Doisy. 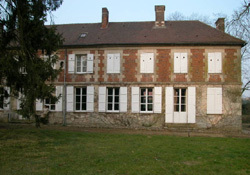 Their eldest son, Philippe, lived with his wife Madeleine-Félicité in the farm belonging to the abbey, by the church. The Duke’s château was sold to one Claude-François Dupressoir. There followed sombre years for Nicolas Pottier. His son Philippe died aged 23. Almost immediately his daughter-in-law remarried Claude-François Dupressoir and moved into the old château. Nicolas’ wife then died. Although he was able, come the Revolution, to buy the nuns’ possessions as “bien nationaux”, he was a broken man and went rapidly insane. He died in 1800. 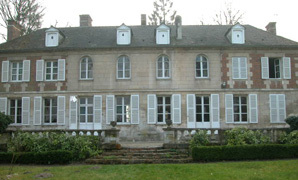 It was then that Claude-François and Madeleine Félicité Dupressoir moved to the house recently renovated by Nicolas Pottier. They brought with them several features of the old château such as wood panelling, doors, and fireplaces with their cast-iron ornaments. During the Empire the enemy forces imposed a sugar-cane embargo on France. Sugar beet was developed as a substitute and this enriched the Dupressoirs who turned their farm into a château on the profits. At a time when Napoleon made a duchess of Madame Sans-Gêne, this was not particularly surprising. The farm building adjoining the “corps de logis” (main house) was demolished and the farm courtyard, reduced in size, became known as “les communs”. The orchards made way for a parc “à l’anglaise” through which wound an alleyway leading to a new gate opening out onto the village and the church. This afforded onlookers a good view of the new château, fronted by its Louis XIV balustrade from the Duke’s château. A new well was built for the personal use of the occupants. Henriette-Félicité Dupressoir, the great-granddaughter of Madeleine Félicité and Claude-François, married a French-naturalised Belgian, Emile Deneufbourg, who was to become mayor of Sacy. It was Emile who created in 1897, on his wife’s land at the far end of the old grounds of the ducal château, the present cemetery, the small chapel at the centre of which bears the names of Deneufbourg and Dupressoir.An Austrian pine dominates the surroundings: Emile planted a row of these grand trees in his garden. Henriette-Félicité, proud of this, made a hole in the corner of the wall and placed a grille there, so that the new cemetery could be seen as it merged into the landscape. A “pigeonnier” (dovecot) was added to the château’s courtyard in about 1850. The Château de Sacy is still in the hands of the descendants of Madeleine Félicité and Claude-François Dupressoir, Hermine Demoriane having inherited the château in 1994. Since then some of the outbuildings have been renovated and the château and grounds have been turned into a venue for art exhibitions and residencies. The château’s gardens have also been developed using organic methods, and volunteer gardeners come from around the world to help with the growing of vegetables, flowers and trees. The existing “potager” (kitchen garden) is still the original one that belonged to Maison Colin. The house and garden, a tranquil haven from the bustle of everyday life, are open to the public during the summer months. Sources: Maurice Lebègue, Les noms des communes du département de l’Oise, 1994; Visit by Madame Marot, lecturer, 18 June 1998, at the instigation of the Comité de Sauvegarde du Patrimoine de Sacy-le-Petit; Louis Graves, Notice archéologiques sur l’Oise, 1855; Georges-Pierre Woimant, Carte Archéologique de la Gaulle, L’Oise 60. CNRS, 1995; Abbé Morel, Houdencourt, seigneurie et paroisse, 1882; Françoise Bertin, archives of the Château de Sacy, 1998.